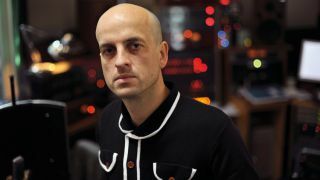 "So much of what I'd call dance music today seems to be about fitting in with what's already there"
Matthew Herbert: "I definitely want to challenge people." Few people have pushed sampled electronic music quite as far as Matthew Herbert. Working under a variety of names over the last 20 years - Wishmountain, Mr. Vertigo, Transformer, Doctor Rockit, Radio Boy, Herbert - this mild-mannered bloke from Kent has made uncompromising albums from noises generated by kitchen utensils, human organs and the life cycle of a farm pig. For his first ever live performance as Wishmountain in 1995, the only instrument he reportedly used was… a crisp packet! "When I got my first sampler, a Casio FZ-1 in 1995, I suddenly realised it was an empty instrument," says Herbert, whose critically acclaimed 2001 album, Bodily Functions, has just been re-released on his own Accidental label. "It was a clean slate, and I could put whatever I wanted on there. I could make music from anything." His boundary-pushing approach has led to remixes, production work and collaborations with everyone from Björk to Ennio Morricone, and last year he was appointed the creative director of the relaunched BBC Radiophonic Workshop. Nice work. It must have been quite an honour to get put in charge of something as iconic as the Radiophonic Workshop. Matthew Herbert: "You could say that! Yeah… incredibly exciting. I remember seeing an interview with [Workshop legend] Delia Derbyshire, and she said that the music they were making back then was never set in the present - it was always set in the future or the past… or even in the mind! I loved that idea. "With the sampler, I could make music with the world." "I suppose the thing that's changed is that we're now in that future, so where do we take the Workshop from here? For me, it's all about collaboration. The new team is made up of people from theatre, engineering, programming, film… We've got people like James Mather, who did some of the sound for the Harry Potter movies. "Hopefully, being a part of the Workshop with offer people something completely different to their day job. I definitely want to challenge people." You studied piano and violin as a kid. How come you ended up falling in love with electronic music? MH: "I knew I was never going to be good enough to be a soloist… I'd never be good enough for the classical world. But you've also got to remember that there was a huge musical shift happening. "You could hear bands like Kraftwerk, OMD and Ultravox on the radio. My music teacher used to play me stuff by Steve Reich. It all seemed so much more open than the classical world. It wasn't just about playing all the right notes in the right order." Was the sampler your first bit of kit? MH: "No, at 14 my parents took out a loan and bought me a Roland Alpha Juno-2, which I've still got. That just unlocked a whole new musical world. "I think the next thing was a pretty rubbish Brother hardware sequencer. It only had two tracks and there was no quantise. The main thing it could do was merge the two tracks, but the fact that it wasn't quantised meant that it was a constant process of commitment to things that weren't perfect. In retrospect, that was probably quite a useful lesson. "But it was the Casio FZ-1 sampler that really changed things for me. There was a mic input on there and it actually took me a while to work out the implications of that. Then, one day I plugged in a mic and bit an apple. That moment changed my life. I pitched it down three octaves or so and, for the first time, I heard the world slowed down. I heard a noise that was way more engaging on a philosophical level than anything I'd ever heard before. "I read somewhere that Brian Eno and John Cage had very similar experiences when they played slowed-down tape. Suddenly, they heard the world atomised and fragmented." The apple sound was 'philosophical'? MH: "Like I said before, I suddenly realised the sampler was an empty instrument. If you write music on a piano or a French horn, it will always sound a certain way - like a piano or a French horn. But the sound of the apple wasn't like anything else I'd heard. I realised the sampler was just a tool. All it says to you is, 'What do you want to do with me? What sounds do you want to make?' With the sampler, I could make music with the world. "For me, one of the greatest travesties of modern samplers is that they come with 14 DVDs' worth of sounds and drum kits. Why would you want to use somebody else's sounds when you could make your own with… a pineapple or David Cameron." Where did you start looking for those early sounds? MH: "Looking back, I think I was quite conservative - no pun intended - in my use of sound back then. I started looking around my house, sampling pepper pots and fridges. Even though I'd glimpsed the power of the sampler, my imagination hadn't caught up with what it was capable of. I eventually started recording in restaurants and on holiday - the sound of crabs being caught on a boat, things like that. "And towards the end of the '90s, I began to think about noises from 'bad' things. Starbucks and McDonald's made noises. Coke cans. Noises that could comment on modern capitalism and homogenisation of the high street." "Why would you want to use somebody else's sounds when you could make your own with… a pineapple or David Cameron." What platform were you working on back then? MH: "An Atari running Cubase, but I'm now on Logic. If I'm being honest, I miss that early version of Cubase - I just think Logic isn't as exciting, and it's got less exciting as the years have gone on. When it first came out, people were doing amazing and very different things on Logic, but now it seems geared to making everybody's music sound the same. Preset channel strips, suggesting compressors - it makes all the decisions for you. "Logic makes organising and storing your samples much easier - back in the Casio days, it was all on floppy disk. But I think we're in danger of turning music into shopping. I'll have a bit of dub bass, a Berlin techno drum kit… it feels like shopping for assembly units. "Don't get me wrong, there's some great music being made today, but there's a lot that just doesn't cut it. A ring tone is not the same as Wagner's Ring Cycle. I'm not saying one is 'better' than the other, I'm just saying that maybe we need to start asking ourselves why we're actually making all this music. "If you're at art college, one of the first things they ask you is, 'What are you trying to say? What impact will your work have?' When I started making music I really did want to change the world, but so much of what I'd call dance music today seems to be about fitting in with what's already there. It's used to sell us things." You wouldn't consider allowing your music to be used on an advert? MH: "I understand that a young band can earn more from one advert than they can from five years touring, but no, I wouldn't allow it because I think it would undermine the original principle of why I made that song. If it was being used to sell shampoo, I'd feel I wasn't telling the truth." But can't music just be music? Does it have to have a point and tell the truth? MH: "Personally, I think it does - it has to have integrity. Whenever I start a song, I always ask myself why I'm writing it. The majority of music on iTunes doesn't get downloaded once… A huge excess of music. Surely you have to question why it was ever written. "It's almost as if there's an excess of choice out there. I went into Comet the other day and they had 35 toasters on display. Yes, we need a choice, maybe five or six toasters - but not 35! The question I'd want to ask is: What is the idea behind all those toasters? Why have they been made? What makes it different to the other 34? And I think it's the same with music." MH: "The next record is going to be made from one sound - one ten-second recording of a Gadaffi war plane bombing people. If you're working with such a limited sound source, you really have to make sure you're very disciplined. It would be too easy to put an 808 kick underneath to beef things up. "The majority of music on iTunes doesn't get downloaded once. Surely you have to question why it was ever written." "When you first hear the clip, all you really hear is the explosion, but if you listen a bit closer, there's an incredible amount of detail. Just before the explosion, someone shouts and there's a whistle - a panicked whistle. That whistle became the melody. For drums, I go through and look for bits of audio shrapnel. I put those over SPD-S pads, played by Tom Skinner. "Another member of the Radiophonic Workshop, Yann Seznec, has built a controller that allows Tom to pull strings and change the amount of distortion, delay feedback and so on. It's all about looking for new ways of expression. New ways to make music. "Just recently, I've been writing all my melodic stuff on Akai pads. I put the sounds across the pads and I'm forced to play them in a different way… different to if they were across a keyboard. It stops me just rehashing old ideas. I'm tricking myself into not playing the same thing over and over." We assume that ten-second recording is meant to engage on a philosophical level. MH: "Of course it is! It raises philosophical and moral questions. I tried to do the same with One Pig, following the life of a pig from birth to being eaten. I tried to do that with Plat Du Jour, looking at the food chain." You can't really write a track called The Truncated Life Of A Modern Industrialised Chicken without raising questions, can you? MH: "Exactly. Why do you think I recorded in places like Starbucks or the Houses of Parliament? It's all about getting people to listen to and examine their world a bit more closely." Do you use a sampler at all these days or just put sounds straight into Logic? MH: "Both. I'm very fond of the 112dB Morgana sampler. It seems to be geared towards people who like that '80s sound and adds a bit of white noise and hiss. It's got real punch and crunch, too. I suppose I like it because it's closer to the sound of the Casio FZ-1 or my old E-MU E64. "But I also dump sounds straight onto the computer. I don't like doing it because I don't think it sounds as good. For the pig record, I recorded all the sounds on a Sennheiser 418 mic and a Nagra V Swiss-made hard drive. With that setup, I felt I was beginning to get close to how I wanted it to sound." You're famously keen on your outboard hardware, but are there any processing plug-ins on the computer? MH: "Some Sugar Bytes stuff, some SoundToys stuff, a UAD card… but that gets used less and less. I've got an 1176 and, compared to that, the card just doesn't stand up. The 1176 really does have its own sound, but the card sounds like every other card out there. "I've probably spent way too much money on outboard. DW Fearn compressors and EQs. Gyraf valve compressors. I've also got an EMT plate reverb and one of the first EMT 252 digital reverbs." Is there any software/plug-in that you'd like to see developed? MH: "That's one of the things we're looking at with the Radiophonic Workshop. We're designing some software that will be free, open source - it will be a new way to write music. We'll be working with new principles and trying to get away from the idea of emulating tape-based studios." Have you ever thought of making music in a 'normal' way? MH: "Ha! When I was a teenager and I first started making music, I did the usual thing of trying to sound like other people - sounding like the songs I heard on the radio. But I failed miserably. I suppose that's when I realised that music is about identity. It's about who you are. Who cares about anyone else?!"